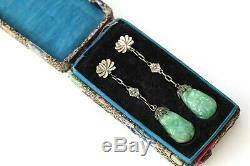 A lovely antique Chinese natural Jadeite Jade dangle drop earrings in original box. 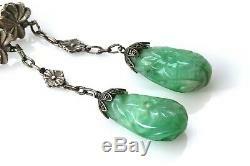 Comprised of a thick natural untreated Jadeite Jade double-sided carving. One side is carved with a flower and the other is carved with leaves and possibly an eggplant. Mottled green with streaks of darker green here and there. 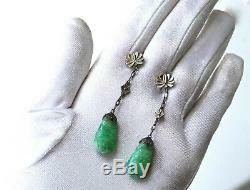 An important characteristic of this pair of Jadeite earrings is the thickness of the stone, measuring approximately 7.20 mm thick. 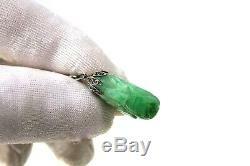 The Jade measures approximately 20.5 x 11.35 x 7.20 mm. 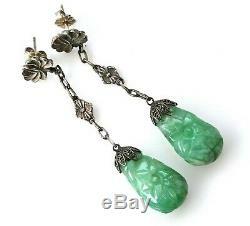 Suspends from silver filigree caps and chain with flower design. 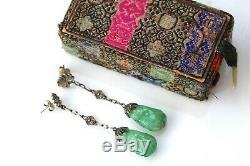 Comes in an original silk box (small rip on the silk in the back of the box). Weight: 7.72 grams (overall). Condition: Overall very good condition as shown on photos. Please examine the photos closely and enlarge them for details. 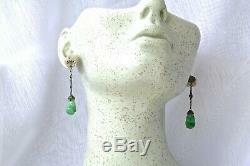 All photos were taken under natural daylight condition, with some under direct sunlight. The photos are an important part of the description. 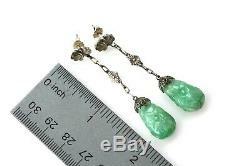 The item "Antique Chinese Natural Jade Dangle Silver Filigree Earrings 2-1/4 L & Box" is in sale since Sunday, March 24, 2019. 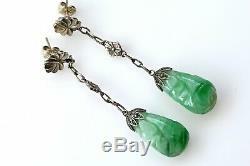 This item is in the category "Jewelry & Watches\Vintage & Antique Jewelry\Costume\Victorian, Edwardian 1837-1910\Earrings". 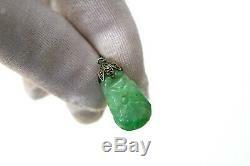 The seller is "myblueginger" and is located in Honolulu, Hawaii. This item can be shipped worldwide.